MODERN, WARM, COMFORTABLE and COSY help to make this property a great stop over for your next trip away. Perfect for holiday makers, business travellers and small families. If you like new things then this is the property for you. Enjoy alfresco dining on the large deck with the Weber BBQ or local dining options available (2 minutes drive) Oh and did I mention the VIEW from the property! It is AMAZING!!!!! 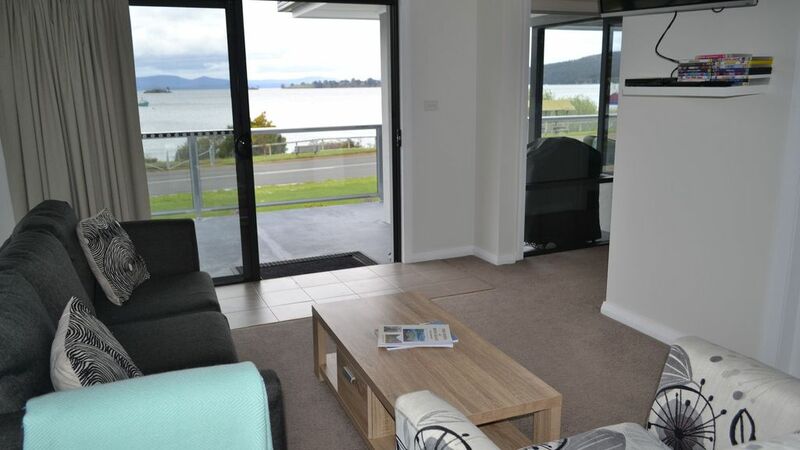 The apartment has stunning water views from the bedrooms, living areas and balcony. Ideal for watching the fishing boats depart and return and of course the ever changing scenery from dawn to dusk. All bedrooms have bedside tables, bedside lamps, tub chairs to sit and relax in and blanket boxes. Beds have electric blankets and quality, crisp white linen. The main bedroom has a mirror robe for hanging your clothes with hangers. The main living area has a DAIKIN reverse cycle air conditioner, which heats/cools the whole apartment. It also has a very comfortable lounge suite, flatscreen TV, bluray DVD player with many up to date DVD's, board games, a selection of books to read and free WIFI. The deck is large and secure with table and chairs so you can enjoy the stunning water views. Look for the family of black swans or maybe if you are lucky enough a pod of dolphins. Watch the birds and the fishing boats /sailing boats depart and return. There is also a Weber BBQ for alfresco dining. The kitchen has a large fridge/freezer, microwave, fan forced oven, stove top, plunger coffee maker, teapot, kettle, toaster, all pots/pans and utensils required for cooking. We will provide a basic pack for your arrival which will include tea, coffee, sugar, cloths and washing up liquid, garbage bags etc. There is a washing machine/dryer if required, please let us know if needed. An iron with ironing board available for your use. A beautiful double vanity sink, modern walk in shower with rail shower system and large overhead rain drop shower head. Complimentary shampoo, conditioner & gel is also provided for your use. Hair dryer also available. The property comes with beds already made with quality crisp white linen. Bath towels/sheets are also provided for your use. After each stay the apartment is professionally cleaned with fresh quality linen supplied. Plenty of free parking available for your stay. Please park in front or to the right hand side of the property. Additional safety features include smoke detectors, carbon monoxide detector, fire blanket, fire extinguisher and first aid kit. If there are any special requests or anything that you would like provided - please let us know when making your booking and we will do our best to cater for your needs. Welcome to check in at your leisure (after 2pm) otherwise let me know your arrival time and i can meet you at the property! I will be available if required, but i prefer to give my quests privacy. DELICIOUS wood fired pizza and seafood restaurant just 2 minutes drive (opened Thursdays to Saturday) and the Dover RSL (opened for lunch and dinner 7 days). Dover also has a local doctor, pharmacy, BP petrol station, IGA supermarket, laundromat, police station, hair salon and post office. Stayed for one night, booked the house the night before......glad we did. The place is easy to find, it has a modern interior, will come back if we are coming back to Tassie. A perfect get away for a mini break. The heavy trucks going past were not so nice when sitting outside, but the ocean view was relaxing. Spacious modern property with stunning view. This place deserves more than an overnight stay. The location is great with views across the bay. Very spacious rooms with a well stocked kitchen. The bed is firm and we had our best sleep here while on holiday. We would stay here again in a heartbeat. We had a wonderful stay at Dover SeaView apt. It had everything we needed and was so comfortable in a little very location. The weather was really chilly, but the apartment was completely cosy. wonderful!